What is a primary hyperparathyroidism? Why are calcium and phosphorous so important? Which doctors specialize in treating hyperparathyroidism? Hyperparathyroidism is a condition characterized by overactivity of the parathyroid glands, four small glands located around the thyroid gland in the neck. Primary hyperparathyroidism occurs when there is a disorder of the parathyroid glands themselves. Secondary hyperparathyroidism results when a condition elsewhere in the body affects the parathyroid glands, causing them to produce too much hormone. Normally, the parathyroid glands secrete parathyroid hormone or PTH, a substance that helps maintain the correct balance of calcium and phosphorus in the body. When blood calcium levels fall too low, the parathyroid glands secrete PTH to restore the blood calcium level. In primary hyperparathyroidism, the elevated levels of PTH cause elevated levels of blood calcium (hypercalcemia). Increased calcium and phosphorus excretion in the urine may cause kidney stones. The most common cause of primary hyperparathyroidism is a benign tumor called an adenoma on one of the parathyroid glands that secretes too much PTH. In other cases, the excess PTH is produced by two or more enlarged parathyroid glands, a condition called hyperplasia. The diagnosis of hyperparathyroidism relies on blood tests to measure hormone and calcium levels. Surgery is the main treatment for hyperparathyroidism. Primary hyperparathyroidism is a disorder of the parathyroid glands, also called parathyroids. "Primary" means this disorder originates in the parathyroids: One or more enlarged, overactive parathyroid glands secretes too much parathyroid hormone (PTH). In secondary hyperparathyroidism, a problem such as kidney failure causes the parathyroids to be overactive. This publication focuses on primary hyperparathyroidism. The parathyroid glands are four pea-sized glands located on the thyroid gland in the neck. Occasionally, a person is born with one or more of the parathyroid glands embedded in the thyroid, in the thymus, or located elsewhere around this area. In most such cases, however, the glands function normally. Though their names are similar, the thyroid and parathyroid glands are entirely different glands, each producing distinct hormones with specific functions. The parathyroid glands secrete PTH, a substance that helps maintain the correct balance of calcium and phosphorus in the body. PTH regulates the level of calcium in the blood, release of calcium from bone, absorption of calcium in the intestine, and excretion of calcium in the urine. When the level of calcium in the blood falls too low, the parathyroid glands secrete just enough PTH to restore the blood calcium level. If the parathyroid glands secrete too much hormone, as happens in primary hyperparathyroidism, the balance is disrupted: Blood calcium rises. This condition of excessive calcium in the blood, called hypercalcemia, is what usually signals the doctor that something may be wrong with the parathyroid glands. In 85 percent of people with primary hyperparathyroidism, a benign tumor called an adenoma has formed on one of the parathyroid glands, causing it to become overactive. Benign tumors are noncancerous. In most other cases, the excess hormone comes from two or more enlarged parathyroid glands, a condition called hyperplasia. Very rarely, hyperparathyroidism is caused by cancer of a parathyroid gland. This excess PTH triggers the release of too much calcium into the bloodstream. The bones may lose calcium, and too much calcium may be absorbed from food. The levels of calcium may increase in the urine, causing kidney stones. PTH also lowers blood phosphorus levels by increasing excretion of phosphorus in the urine. In the United States, about 100,000 people develop the disorder each year. Women outnumber men two to one, and risk increases with age. In women 60 years and older, two out of 1,000 will develop hyperparathyroidism each year. Phosphorus is found in all bodily tissue. It is a main part of every cell with many roles in each. Combined with calcium, phosphorus gives strength and rigidity to your bones and teeth. In most cases doctors don't know the cause. The vast majority of cases occur in people with no family history of the disorder. Only about 5 percent of cases can be linked to an inherited problem. Familial multiple endocrine neoplasia type 1 is a rare, inherited syndrome that affects the parathyroids as well as the pancreas and the pituitary gland. Another rare genetic disorder, familial hypocalciuric hypercalcemia, is sometimes confused with typical hyperparathyroidism. Each accounts for about 2 percent of primary hyperparathyroidism cases. Patients may have thinning of the bones without symptoms, but with risk of fractures. Increased calcium and phosphorus excretion in the urine may cause kidney stones. Is there a blood test to diagnose hyperparathyroidism? Once the diagnosis is established, other tests may be done to assess complications. Because high PTH levels can cause bones to weaken from calcium loss, a measurement of bone density can help assess bone loss and the risk of fractures. Abdominal images may reveal the presence of kidney stones and a 24-hour urine collection may provide information on kidney damage, the risk of stone formation, and the risk of familial hypocalciuric hypercalcemia. Will surgery (parathyroidectomy) cure hyperthyroidism? Surgery to remove the enlarged gland(s) (parathyroidectomy) is the main treatment for the disorder and cures it in 95 percent of operations, with low complication rates when performed by surgeons experienced with hyperparathyroidism. 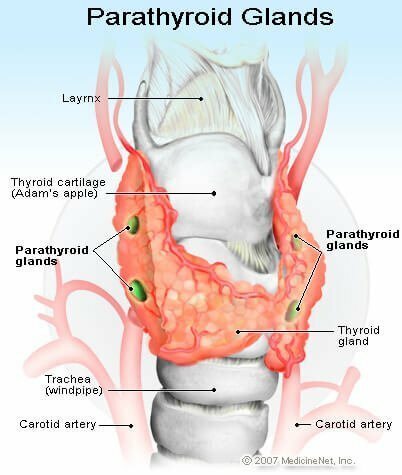 What are the complications of parathyroidectomy surgery? About 1% of patients undergoing surgery experience damage to the nerves controlling the vocal cords, which can affect speech. One to 5% of patients lose all their parathyroid tissue and thus develop chronic low calcium levels, which may require treatment with calcium or vitamin D.
The complication rate is slightly higher for hyperplasia than it is for adenoma since more extensive surgery is needed. The NIH panels recommended against the use of expensive imaging tests to locate benign tumors before initial surgery. Such tests are not likely to improve the success rate of surgery, which is about 95 percent when performed by experienced surgeons. Simple imaging tests before surgery are preferred by some surgeons. Localization tests are useful in patients having a second operation for recurrent or persistent hyperparathyroidism. What are other treatment options for hyperparathyroidism? Calcimimetics are a new class of drug that turns off secretion of PTH. They have been approved by the Food and Drug Administration for the treatment of hyperparathyroidism secondary to kidney failure with dialysis, and primary hyperparathyroidism caused by parathyroid cancer. They have not been approved for primary hyperparathyroidism, but some physicians have begun prescribing calcimimetics for some patients with this condition. Patients can discuss this class of drug in more detail with their physicians. Some patients who have mild disease may not need immediate treatment, according to panels convened by the National Institutes of Health (NIH) in 2002. Patients who are symptom-free, whose blood calcium is only slightly elevated, and whose kidneys and bones are normal may wish to talk with their physicians about long-term monitoring. In the 2002 recommendation, periodic monitoring would consist of clinical evaluation, measurement of serum calcium levels, and bone mass measurement. If the patient and physician choose long-term follow-up, the patient should try to drink lots of water, get plenty of exercise, and avoid certain diuretics, such as the thiazides. Immobilization (inability to move) and gastrointestinal illness with vomiting or diarrhea can cause calcium levels to rise. Patients with hyperparathyroidism should seek medical attention if they find themselves immobilized, vomiting, or having diarrhea. Endocrinologists are doctors who specialize in hormonal problems. Nephrologists are doctors who specialize in kidney and mineral disorders. Along with surgeons who are experienced in endocrine surgery, endocrinologists and nephrologists are best qualified to treat people with hyperparathyroidism. Organizations that help people with hyperparathyroidism may have additional information to assist in finding a qualified health professional nearby. SOURCE: National Institutes of Health. "Primary Hyperparathyroidism." Updated: August 2012.